Star Wars Origami Book (2018) | Nerd Much? Get ready for the perfect crossover of Star Wars fandom and origami. Ever look at a droid like BB-8 and think, “I could fold that”? Well then this is the perfect book for you: the Star Wars Origami Paperback, is available now on Amazon. If you follow us on Instagram (ahem! ), you may have noticed that we posted this book on our feed a couple weeks ago because we were so impressed with the quality. 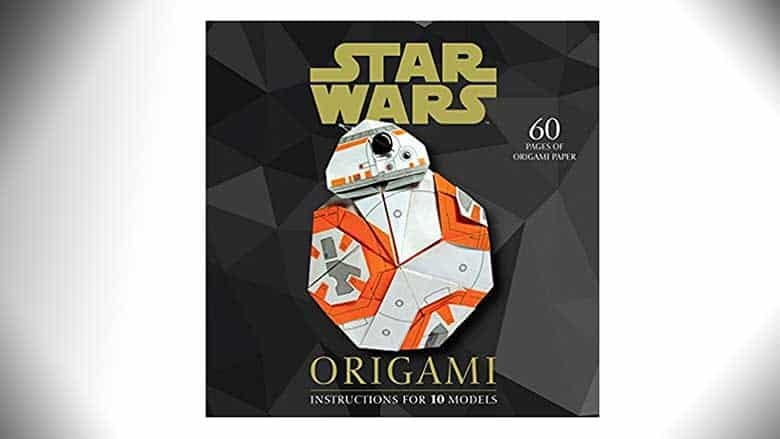 Even newbies to the craft of Origami will love this new book filled with various Star Wars origami projects. Recreate your favorite ships, droids and other characters from the current trilogy. Star Wars Origami comes with 100 pages of pre-printed origami paper to use in folding your very own Star Wars paper creations. Get that perfect look with coordinating paper and projects, and wow your coworkers with your Star Wars Origami adorned desk space. This Star Wars Origami paperback also comes with directions for 10 different creations, ranging in difficulty from beginner to expert. No need to worry about purchasing specialty paper separately, as there are sheets included. Create your very own paper TYE-Fighter, or Millennium Falcon with ease, as the paper provided even has fold lines to guide you through your project. Order yours today for just $20.61 at Amazon.com. Looking for the perfect project to keep someone busy this summer, look no further. This Star Wars Origami paperback is the perfect gift for the Star Wars fan in your life.